Have you ever heard of Frog Eye Salad? Maybe you call it Acini Di Pepe Pasta Salad. 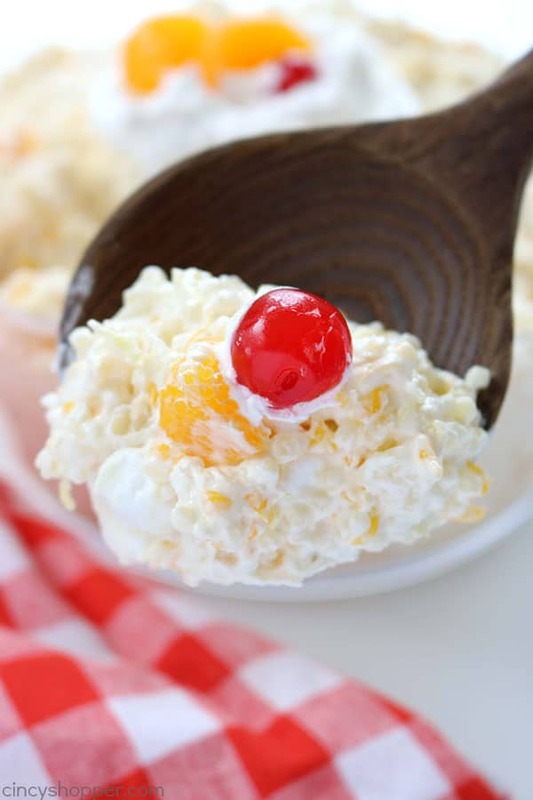 Whichever you call it, this sweet fruity pasta salad is perfect for a summer BBQ side dish! 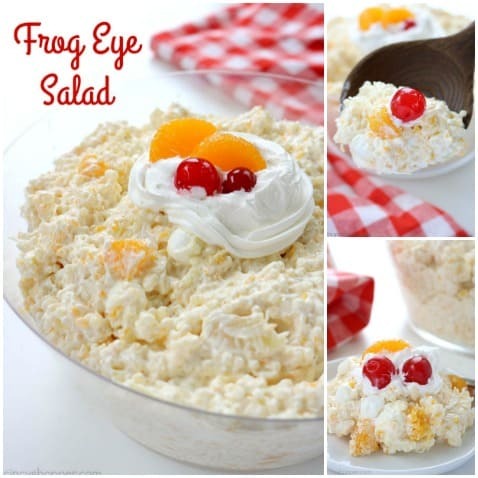 For the past few years, I have noticed Frog Eye Salad recipes floating around on Pinterest. To be honest, I was a bit skeptical. Fruit, pasta and custard? It just did not sound to tasty to me. Oh boy… I was so wrong. This salad is out of this world amazing! The flavors of pineapple, orange, coconut, and marshmallow all blend so well with the Acini Di Pepe pasta. I have never ever heard of Acini Di Pepe pasta in my entire life. After sharing another bloggers Frog Eye Salad on my personal Facebook, one of my cousins posted that this was the salad that her family had brought to family BBQ’s for years. 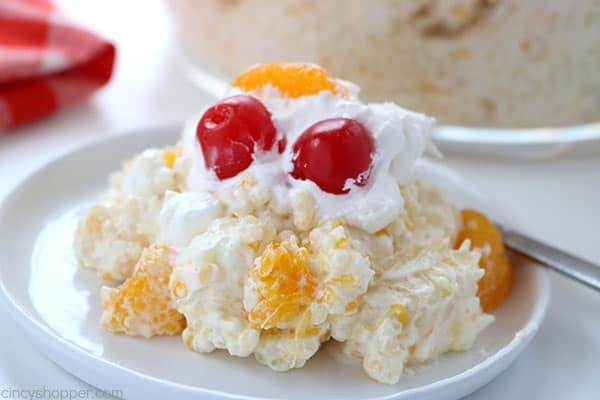 She stated that her family version included fruit cocktail and they referred to it as Acini Di Pepe Pasta Salad. Maybe it did not sound to good to me as a child at those family BBQ’s. I have been missing out for years. 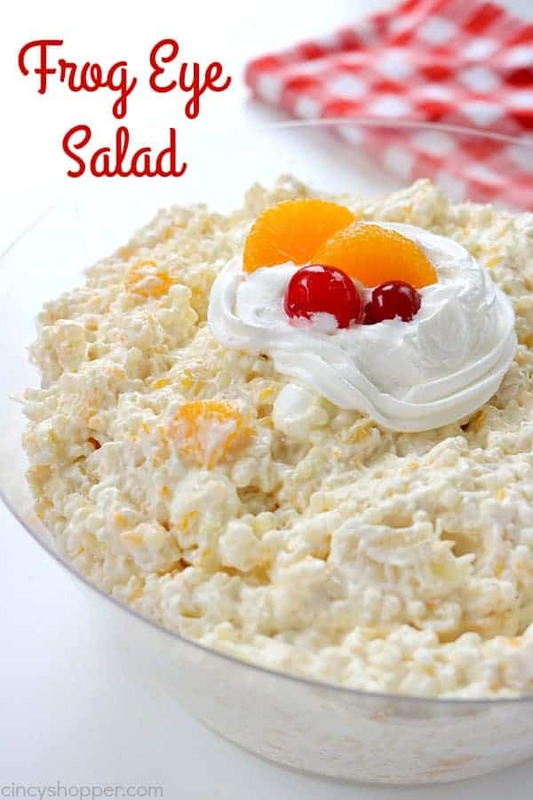 I usually stick to a basic Creamy Fruit Salad. But…this has quickly become one of my favorite summer salads that I have made this year. I ate so much the first time I almost made myself sick, lol. It was so tasty that I couldn’t control myself from eating two large platefuls for lunch. I think it would make a great year round salad. I like it so much, it will become a regular side dish at our house. To make this delicious Frog Eye Salad, you will need Acini Di Pepe Pasta. I found mine in a very small bag at my Kroger. 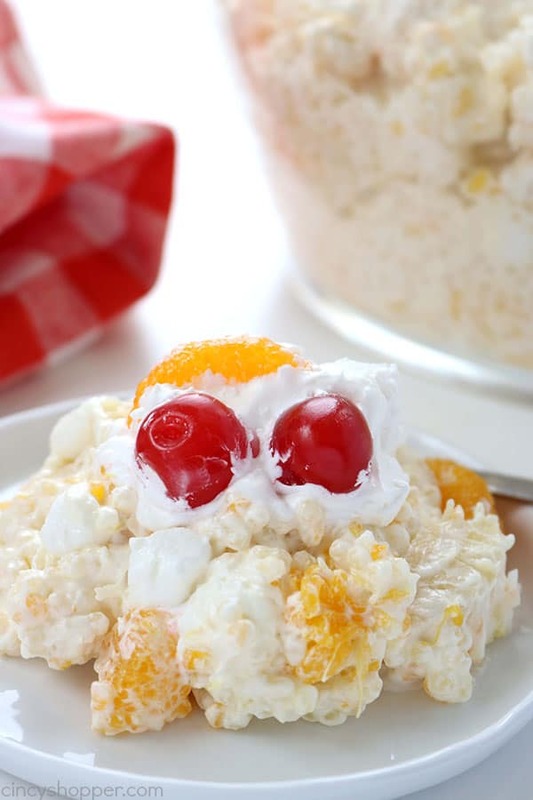 I used crushed and whole pineapple junks, mandarin oranges, coconut, and marshmallows. You will also need some Cool-Whip, eggs, milk, and flour. 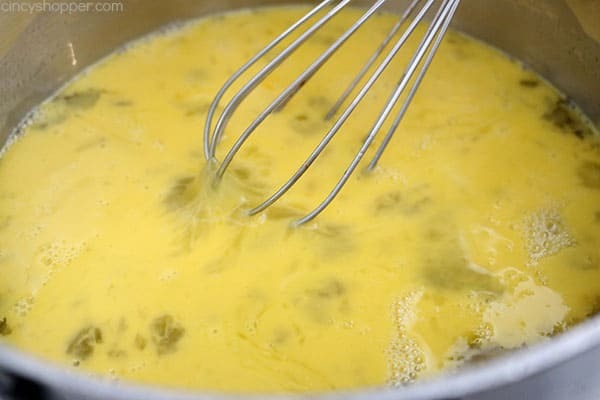 Making the custard is so simple. 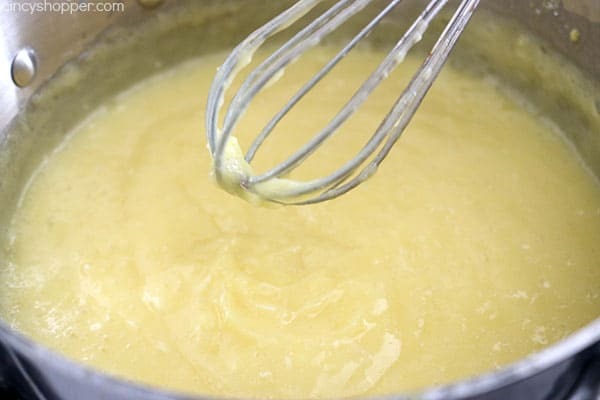 I was just very careful to whisk constantly and I pulled it off the heat as soon as I noticed a custard like consistency. Drain mandarin oranges discarding juice. 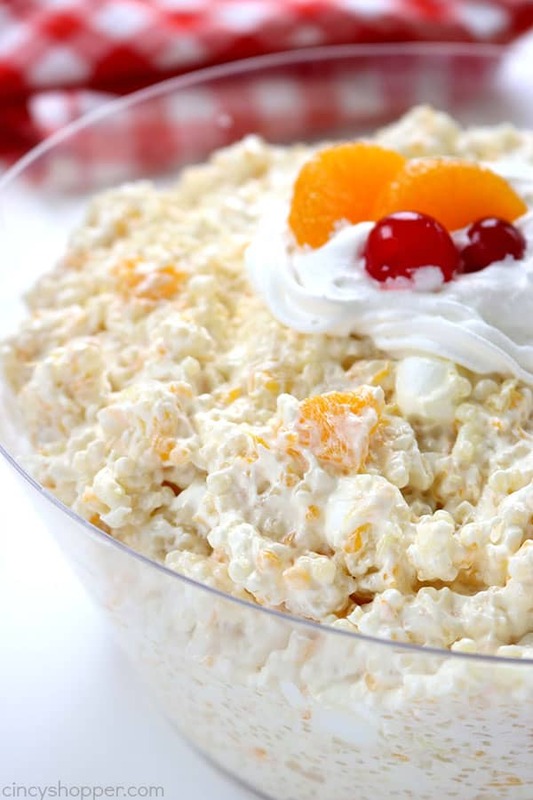 Place oranges in a large mixing bowl. Drain pineapple chunks discarding juice. 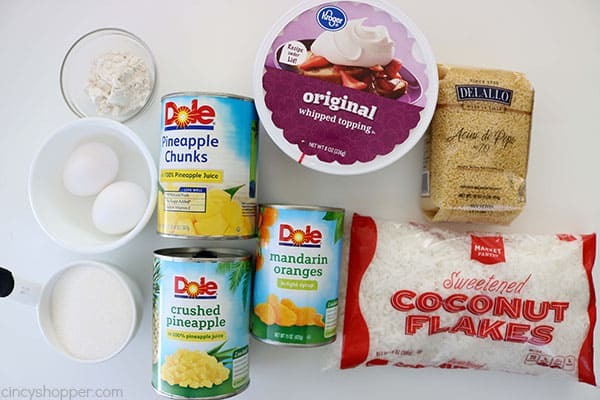 Add pineapple chunks to large mixing bowl. Thoroughly drain crushed pineapple and save the pineapple juice. Add crushed pineapple to large mixing bowl. 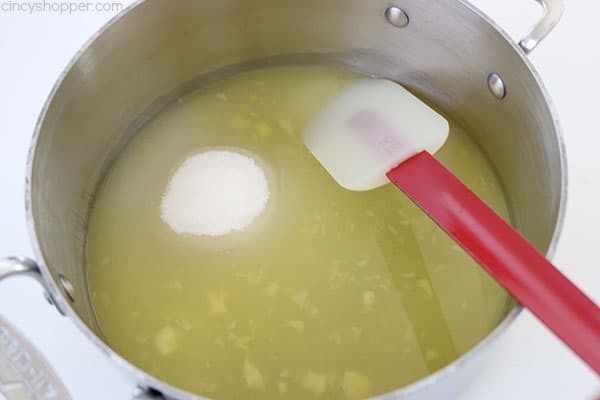 In a medium saucepan over low heat, add reserved pineapple juice and sugar whisking until dissolved. 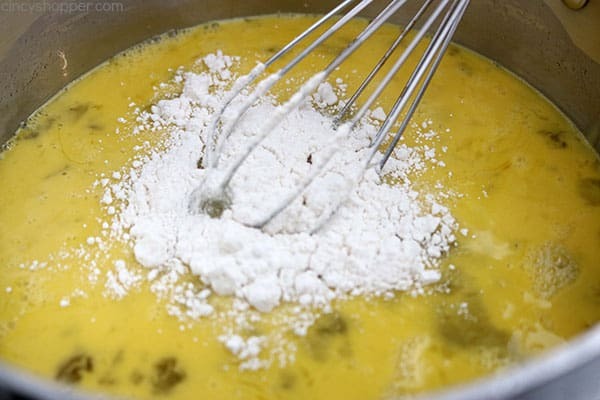 Add eggs and flour to whisking constantly. Remove from heat when custartd texture is reached (for best results, use a candy thermometer to check for temperature of 170). 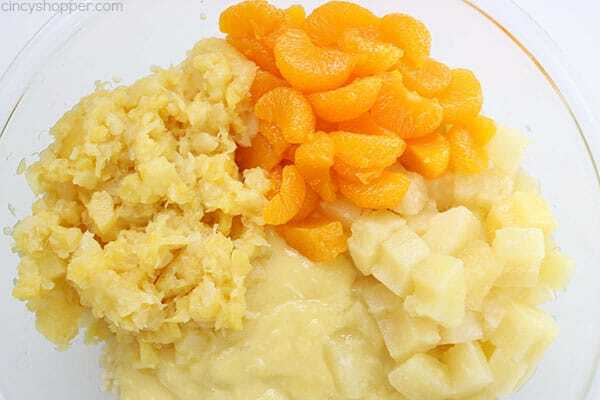 Add the pasta and cooled custard into the bowl with the fruit and gently mix. 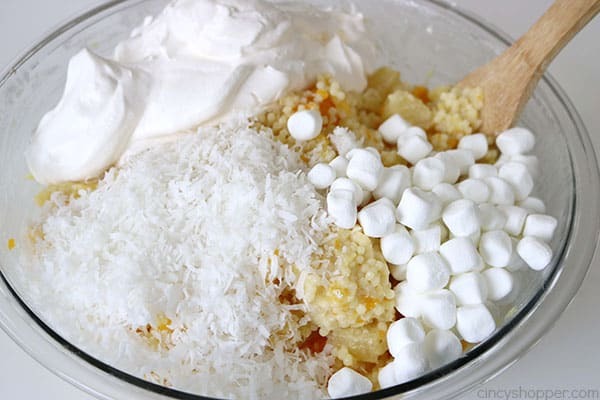 Add Cool Whip, coconut and marshmallows and mix to combine before serving. Do you make delicious salads for your summer picnics?